Exterior view courtesy of iowabackroads.com. I bought this souvenir coffee mug. Phil Roberts photo. 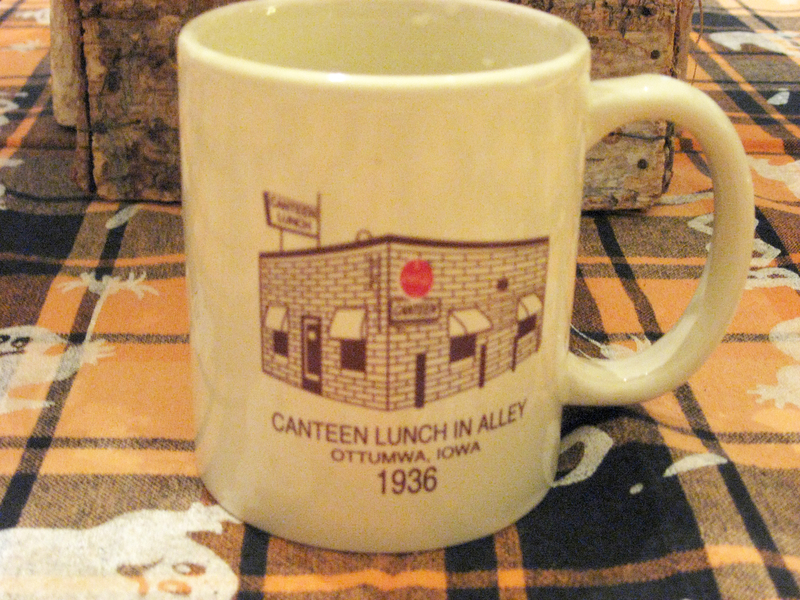 I knew the Ottumwa restaurant, Canteen Lunch in the Alley, was no ordinary place based on what we had read about it: It was the model for the Lanford Lunch Box restaurant opened by Roseanne Connor (played by Roseanne Barr) in her sitcom, “Roseanne.” You’ll recall that she was married to Ottumwa native Tom Arnold, and they often visited Ottumwa during their marriage. Well, we didn’t make it there in 2012, but we did stop in on a recent Saturday afternoon. My wife Sherry and I were on a road trip and were looking for an out-of-the-ordinary place to eat. We had made our annual trek to southeast Iowa for the Villages of Van Buren Fall Festival. We had planned to eat lunch at one of our favorite restaurants there, Bonaparte Retreat in Bonaparte, Iowa. Located in an old gristmill, the place has a folksy atmosphere and serves great food at a fair price. But it was only open from 11 to 1 for lunch, and we arrived at 1:15. It wouldn’t reopen until “4:30-ish,” according to a sign on the porch. So after checking out the various shops in downtown Bonaparte, we drove on in search of a unique place to eat. My cell phone, which probably now qualifies for antique status, is far from a smart phone. But, lucky for me, my wife has a smart phone and knows how to use it. So she got on the Internet and searched for restaurants that sounded interesting and were nearby. The problem was, it was about 3 o’clock by then, and most of them were closed. Then she stumbled across the listing for Canteen Lunch in the Alley and discovered it was open from 10 to 8 on Saturdays. Perfect! We set the GPS for 112 E. Second St. in Ottumwa, and we were on our way. Soon we were standing in front of a small, yellow-painted brick building. Sure enough, its front door did open onto an alley. It was surrounded on two sides by the parking ramp, which also was built over the top of it. The original five-stool Canteen Lunch opened elsewhere in 1927. It moved to its present location in 1936. I knew this wasn’t going to be gourmet dining, but it looked like my kind of place. We opened the door and walked in. I looked for a table, but there weren’t any. The only table there was one in a corner that was covered with souvenir T-shirts for sale. Seating was on one of 16 stools surrounding a horseshoe-shaped lunch counter with a white-speckled Formica countertop. The walls were decorated with a painting of the place, copies of which are for sale; a U.S. map with pushpins so customers can indicate where they’re from; and an old landscape painting, darkened with age. The menu, also posted on a wall, was short and sweet. Offerings included the Canteen sandwich, a cheeseburger, a hot dog, an egg sandwich, homemade pie, chips, soft drinks and ice cream goodies. The trademark Canteen sandwich, which sells for $3.60, is assembled right in front of customers. The loose meat (think in terms of a Sloppy Joe or Maid-Rite) stays warm in a square, steaming hot, stainless-steel tub inside the bend of the horseshoe counter and is scooped onto a large bun. With that, and all the other sandwiches for that matter, you have your choice of five items to go on it: melted cheese, ketchup, mustard, onions and pickles. 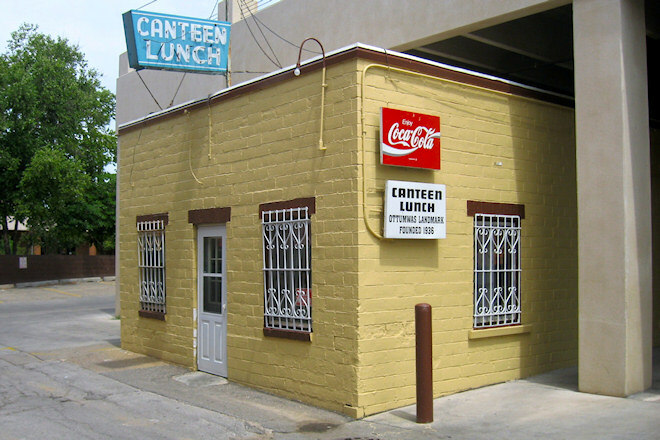 By the time we arrived at Canteen Lunch in the Alley, I was famished. So I ordered a canteen sandwich, an egg sandwich (we’re not talking egg salad here, but rather a fried egg served on a bun) and a root beer float. I also bought a souvenir coffee mug. Sherry had a Canteen sandwich, a bag of chips and a chocolate malt. Everything was tasty, and the three women working there were friendly and provided quick service. If you want to experience this Iowa icon, hours are 10 a.m. to 7 p.m. Monday through Wednesday and 10 a.m. to 8 p.m. Thursday through Saturday. But, to be safe, call ahead at (641) 682-5320. And take some cash — they don’t accept credit cards. Copyright 2013 by Phil Roberts, Creative Enterprises. This piece is being submitted as a column to The North Scott Press. It’s on my bucket list. I’m pretty sure I ate there once in the 70’s.